Having a regular eye exam is crucial in protecting your and your family’s eyesight. These exams allow Dr. Chester Quan and Dr.Christina Chang to detect changes in the front of your eye so alterations can be made to your eyeglass or contact lens prescription. However, your doctor also needs to look at the back of your eye, the retina, to check that it is healthy and not damaged or showing signs of disease. Your annual eye exam should include more than just reading an eye chart. Ask us about non- invasive OCT and OCTA imaging and Optomap Retinal Scan. Under normal circumstances, dilation drops might not be necessary, but Dr. Chester Quan and Dr. Christina Chang will decide if your pupils need to be dilated depending on your conditions. The capture takes less than a second. Images are available immediately for review. You can see your own retina. You see exactly what your eye care practitioner sees – even in a 3D animation. What is an OCT and OCTA image? Dr. Chester Quan and Christina Chang at Visionarium Optometry are dedicated to using the latest developing technology that help the manage treatment options for patients suffering from ocular diseases. In just a few seconds our painless and non-invasive OCT and OCTA imaging scans can give Dr.
Quan and Dr. Chang a comprehensive view of your ocular health. This type of imaging visualizes the structures of your eye — from the front, or anterior segment, to the back, or retina. Dr. Chester Quan and Dr. Christina Chang may use OCT aid in diagnosing disease and managing your ocular health. OCTA is the only non-invasive way Dr. Chester Quan and Dr. Christina Chang to visualize the vascular structures of your retina. 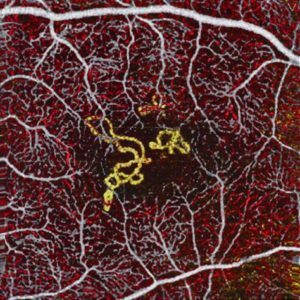 Previously the only way to visualize these blood vessels used fluorescein angiography, a lengthy procedure requiring injections of contrast dye associated with a wide range of side effects and limited imaging results. With AngioVue, high quality images are available in seconds, without the use of dye injections.